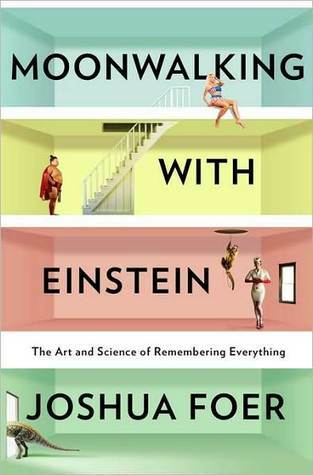 I went through a whirlwind of books recently and one of them was the very fun Moonwalking with Einstein: The Art and Science of Remembering Everything by Joshua Foer. The book received a lot of positive attention when it came out, so it was on my must-read list for awhile. Unfortunately, it also received a ton of negative reviews. Due to the sheer volume of complaints from people who were disappointed — and in some cases “furious” — I feel obligated to mention it as a disclaimer: This book is not a self help book on improving memory. It’s not a guide for doing amazing mental feats and although you can glean a fair amount of tips and advice from the content of the book, that isn’t its aim. Moonwalking With Einstein‘s aim is an overview of the practice of memorisation, in history and as practiced today by “mental athletes.” There are two primary story lines within the book: one following the author from “regular guy” journalist to a participant in the US Memory Championships. The other path traces the history of humanity’s use of memory and the basic science behind it, albeit on a surface level. These two sections are interwoven with each other throughout the text, giving an interesting narrative strengthened with scientific and historical information. I found them to flow well together as I progressed through the book. Foer’s personal journey begins as a journalist covering the US Memory Championships, where he has gone expecting to see some kind of rainman olympics. He discovers, however, that many of the attendees are not savants and, in fact, most believe that anyone can do these impressive tricks with a little bit of daily practice. His suspicions of this claim are what ultimately lead him to take a wager to begin his own training to find out the truth. We follow him as he interviews and investigates other athletes, and speaks with neuroscientists who study memory and memory advocates who see great potential in maintaining the art we are losing to ever-present technology. Throughout the book, he talks with a great deal of people who are famous in the obscure realm of super memory, and if this is a topic that has interested you before, you’ve probably heard of many of them. As we journey with the author, we also learn about how humans have used memory in the past from ancient times to recent history. Foer discusses things like oral tradition in cultures, spoken poetry and storytelling, the role that memory has played in education, the lengths some people have gone to to store knowledge, and the thousands of current books that exist on this topic which reflect human’s infatuation with the topic. The historical coverage is what I found to be most insightful. I knew, for example, that before written language was prevalent societies relied heavily on memory, not just to transmit culture but also for every day tasks. I didn’t know, however, that when the printed word was first becoming available to the common person, that books were initially viewed as “memory aides” – not as a place to store facts in order to forget them, but as a written guide to prod you to remember things you’d already studied. I found Foer’s discussions with educators supporting memory development in students to be especially thought-provoking. Rote memorisation is often dismissed as a pale shadow to “real” learning, and I would have agreed with this. However, many people through out the book pointed out that we require a foundation of knowledge to build our own ideas and draw influence from, and that the broader that foundation, the more equipped we are to become creative or wise people. I thought that was an important consideration and it shifted my perspective a bit. If one judges Moonwalking with Einstein based on the merits of what it is rather than what one wants it to be, I think the book is enjoyable and worth the read. You may not be capable of memorising decks of cards once you turn the final page, but you will have gained some insight into the function and amazing potential of memory. 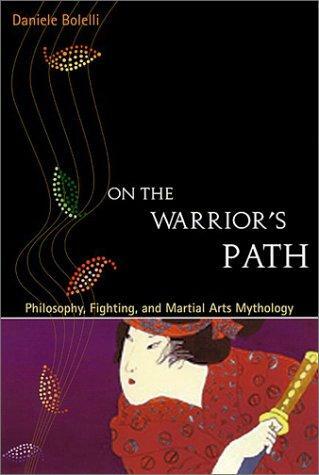 About seven or eight years ago, I crossed On the Warrior’s Path: Philosophy, Fighting, and Martial Arts Mythology by Daniele Bolelli in a bookstore and was surprised to recognise the author’s name as one of my professors from college. Considering how fond I had been of him and his [completely different topic than the book] class, I immediately picked it up. I absolutely loved the book, and have gone on to buy copies for several friends. Since the second edition was released in recent years, I thought it deserved a re-read and a look here. At its core, the book is about the warrior archetype. Not just about the ubiquitous warriors from tribal cultures and feudal societies, but also those metaphorical warriors who exhibit the same fiery spirit and fearless attitude. Bolelli argues that this isn’t just some abstract mythos to muse over or read about in books. The samurai you see fighting in the movies more than thrilling entertainment; he’s a hyperbolic manifestation of something that is absolutely critical to human experience. The book is not saying we should be picking up swords and fighting each other, but that the mythology of the warrior has something to offer us, something valuable that transcends culture and time and class and career and gender. There is a reason those martial arts movies speak to us, and it isn’t because we find the plot engaging, it’s because there is something about that archetypal figure that speaks to our souls. Bolelli looks to martial arts as one means to cultivate a personal warrior spirit. Although it may not always manifest that way in reality, martial arts has for centuries encouraged the essential harmony of body and mind, physical and mental. There is a river of philosophical introspection and shaping one’s character at the foundation of martial arts. But just as an academic who spends too much time divorced from reality in his studies [oops! ], this abstract philosophy isn’t enough by itself. Shaping the mind is nothing if you ignore the body. Martial arts has the ability to take that deep insight and ground it in the physical, and therein lies its uniqueness. However, the book doesn’t argue this is the only way to do this (in this respect, the book perhaps is a bit more catered to martial artists since they only need to apply the insight to something they are already involved in). If the first half of the book is extrapolating the warrior mythology into our lives, the second half — save for one personal chapter — is more about injecting it into martial arts . I suppose that sounds unusual, since you might think that it’s already a given there, but it’s not. Bolelli discusses the different warrior archetypes we find in mythology and media, from the honourbound Samurai to the lawless mercenary, and the strengths they represent and the flaws they must fight. The book is critical of the status of martial arts today and the rigidity of many classic schools of fighting. He evaluates the paradigm shift brought on by things like UFC, MMA, or Bruce Lee’s Jeet Kune Do that have started a revolution to allow martial arts to grow and become more dynamic by applying the philosophy of: “take what works, leave what doesn’t.” For those readers who are unfamiliar with martial arts, don’t feel intimidated. It does not ever assume knowledge and there is even an entire chapter outlining most of the different schools and styles. This second half is a little more structured, objective, with more concrete information than the early part of the book. It’s also a little disjointed; I believe the latter half was actually previously published as separate Italian publication(s), and was translated and worked into this book for English readers. Although the content is still appropriate and a relevant pairing for the first half, and Bolelli is able to tie it into the overall theme, the writing style is a little less relaxed, and is littered with citations that you didn’t previously see a lot of, so you can definitely feel the transition between halves. I admit to have glanced at other reviews, and some people don’t like the second half. I did. It’s good, just different. The heart of the book is a lesson about the way we approach our lives. The book is very Taoist, but not in a preachy way (can a Taoist even be preachy?) and a bit Zen Buddhist. It emphasises the importance of balance. It’s about forging our paths bravely, being in charge of our destiny without being totally in control, loving peace but charging fearlessly into battle when required. It’s about living fully: don’t be an athlete that can’t lose herself in a book, and don’t be an scholar that simply thinks of their body as transportation for their brain. A housewife can be a warrior, a soldier can set aside his rifle and cradle a baby, a fighter can write poetry. If you’re into martial arts and haven’t read this, you should pick it up immediately. But don’t be dissuaded if philosophy isn’t your thing, or even if you have no martial arts background (I don’t): this book can be applicable and insightful to anyone. Our lives are what we make of them, and we owe it to ourselves to instill power and meaning into the experience. Thea Cooper and Arthur Ainsberg’s book Breakthrough: Elizabeth Hughes, the Discovery of Insulin, and the Making of a Medical Miracle is about medical science’s triumph over insulin-dependent diabetes. 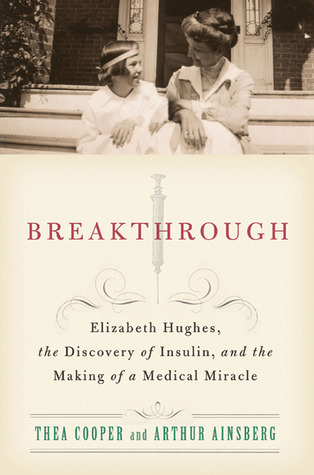 Breakthrough follows one of America’s first recipients of insulin, Elizabeth Hughes, but the book is only partly about her personal story. The book takes you on a journey through through the lives of the scientists, doctors and patients impacted by diabetes mellitus, their lives revolved around the urgency of a cure. You wonder, sad and anxious, whether particular sick children will survive to see a breakthrough. I found that the most maddening thing is how very close science was to finding the key for so long. They knew a lot about the disease, they knew the pancreas and insulin had some kind of relevancy, and there had been studies and experiments done in the area… but nothing conclusive or seemingly worth pursuing. It seemed like so many people were on the tip of a revelation but no one was able to take those final conclusive steps until Frederick Banting and Charles Best (along with John James Rickard Macleod), who are credited with the cure. Elizabeth Hughes is only one player in the story and not even really the most interesting one, although following her through the events provides a compelling and personal backbone to the story. Unfortunately for both the authors and the reader, in adulthood Hughes destroyed all letters, photos and articles pertaining to her childhood illness and with it any additional insight that documentation might have provided. Although it is presented in a positive light of her final step to truly living a “normal life” post-treatment, and couldn’t help but wonder what the book would have been had she let those documents survived. There are so many unanswered questions, not just about her illness but about her life and relationships from that period. As a result, the actual information on Elizabeth and her experience is relatively thin for being just a major character within the book. Still, Elizabeth provides the reader with a very particular person to root for rather than another faceless, sickly child and allows the story to feel more emotionally engaging. The primary critique of the book has been the ficionalised aspects of it. Although the foundation of the book is solid history and good science, there are lots of bits of dialogue and personal thoughts and feelings from [otherwise real] people that are speculation on the part of the authors. Although I am familiar with nonfiction being written in a novel-esque fashion, unlike other books where the dialogue was based off of real diaries and letters, in Breakthrough is almost entirely fabricated. Of course, this is largely a necessity because Elizabeth Hughes intentionally destroyed so many things pertaining to those years of her life; there was little remaining for Cooper and Ainsberg to work with. However, the book is clear and honest about which aspects are speculative, so there is no deception to the reader. I mention it only because I know this is bothersome to some people. If that particularly issue doesn’t bother you, the book is very worth the read. It is well-researched, interesting and quite informative. Because it is written in the style of a novel, it will be an easy read for even those who are not particularly fond of non-fiction writing. Although I knew a bit about diabetes, I had never read a book in this area before, so I learned a lot from Breakthrough. Although I knew that diabetes was a serious illness that could result in death when untreated, I had no idea the full extent of just how fatal Type I Diabetes was before insulin treatments were developed: children usually died within just a few weeks or months of diagnosis, seldom living beyond a year. It was also horrifying but fascinating to learn about the Allen treatment — one of the few things that could be done to prolong life — where children were literally starved (often to death) in an effort to grant them a few precious additional months to live. It is a tragic story but luckily one that, for at least Elizabeth Hughes and people today, resulted in a happy ending. The Rebbe’s Army: Inside the World of Chabad-Lubavitch is a look at one of the largest and perhaps best-known branches of Orthodox Judaism. It is written by journalist Sue Fishkoff who, although an outsider to the sect, manages to be insightful and respectful but still completely honest. There are very few books on modern-day Hassidic Judaism, and even fewer good ones, but The Rebbe’s Army is one that stands out. I would like to think this book would be fascinating even to people without a Jewish background, or perhaps more so, as they enter the topic without bias. Chabad has a very paradoxical position in today’s world. Unlike many Orthdox sects of Judaism that eschew modernity and the secular world, Chabad has instead embraced it as a vehicle for their movement. Their website, Chabad.org, remains the most comprehensive and oft-visited resource for Judaism on the internet. Every year, Chabad holds a telethon that is broadcast on mainstream television in Los Angeles. Filled with celebrities, it raises millions each year for their various programs to help Jews around the world. Although they are not the largest Orthodox sect in terms of adherents, they are easily the most visible. Outside the Jewish world, they may be synonymous with the word “Jew” to many, with their identifiable black hats and archaic garb, often seen on television during liaisons with politicians during holidays. Despite their heavy media presence, they still remain devoted followers of their religious traditions and leaders, expressing their beliefs in the same way as their ancestors did hundreds of years ago in Eastern Europe. Within the Jewish world, the movement is controversial for their vocal enthusiasm for religious observance and their outreach programs to encourage nonreligious Jews to return to the traditions and rites of orthodoxy. Although they meet disapproval for their pushy agenda on one front, Chabad provides services to Jews all over the world regardless of affiliation: summer camps for kids, rehab centres, educational programs and schools, assistance with Jewish observance, and religious and ethical advice. Travelers overseas may find “Chabad houses” to attend services even in the most remote of places, emissaries to the faith that open their doors to Jews in places with little or no community. Even a Jew who is vehemently opposed to Chabad’s methods may still use their website to consult a rabbi for advice or receive a daily newsletter, and may attend services at one of their synagogues for the High Holy Days. Fishkoff also explores the more hush-hush and massively more controversial Chabad Messianic movement. The sect has long followed their Rebbes, the great leaders of the religious community, since it began in the 18th century. The last Rebbe, Menachem Mendel Schneerson, was responsible for founding many of the outreach programs that Chabad is known for today. Influenced by his wisdom and deep impact on contemporary Judaism, a movement developed within the Chabad community theorising Schneerson to be the long-awaited Messiah of the Jewish people. This movement was shaken but not destroyed with his death in 1994, and many of his followers believe he will return from death to lead the Jewish people. Although this schism remains somewhat localised to New York, the Messianics are very vocal and still persist today, to the chagrin of the anti-messianics both within Chabad and other Jewish movements. 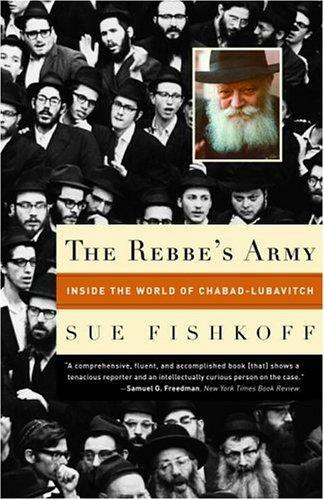 The Rebbe’s Army offers great insight into the philosophy and practices of Chabad-Lubavitch today. From the daily religious lives of the adherents, the philosophy behind their outreach programs, and their historical religious traditions, Fishkoff covers it all in an informative, accessible way. She doesn’t do this from afar, but dives right into the community starting at their headquarters in the Crown Heights neighbourhood in Brooklyn. She sits along side them at Shabbat tables, attends religious services, and speaks at great length with many, many Lubavitchers. Although she remains a non-practictioner, uncomfortable with many of their traditions, her approach is respectful and deeply illuminating. 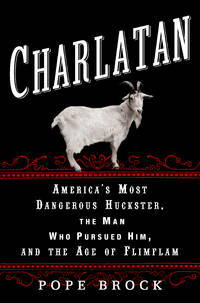 Charlatan: America’s Most Dangerous Huckster, the Man Who Pursued Him, and the Age of Flimflam by Pope Brock is an engaging historical tale about medical quackery from the early 20th century. I enjoyed the brief mention this story had received in Mary Roach’s Bonk, but it was great to read the whole tale. The book follows one of America’s greatest con artists, John Brinkley, and his arch-nemesis Dr. Morris Fishbein. Fishbein, whose pet project was debunking medical quackery, worked tirelessly to expose Brinkley for what he was. The book is equally about Fishbein as it is about Brinkley, but the con artist’s tale really steals the show. John Brinkley was a con-man from a poor background who purchased medical degrees and made his way around the country posing as a doctor selling ridiculous treatments to gullible people. He became famous for one procedure in particular: transplanting goat testicles into healthy adult men in an attempt to increase their virility. Despite having no medical training, minimal grasp on sanitation, and leaving a wake of sick, crippled and unhappy patients, Brinkley earned millions. Brinkley was a true charlatan, charismatic and wildly popular. He was rich, famous and respected. He ran for political office several times, losing only narrowly to his opponents. When he was chased from state to state by medical licensing boards, Fishbein, and eventually the law, he set up shop in Mexico just south of the Texan border so he could broadcast his crazy medical ideas across the border without repercussion. His border blaster radio station remained hugely popular despite his controversial medical beliefs and brushes with the law, and made him somewhat of a pioneer in radio. Eventually the hammer was brought down on Brinkley as he lost multiple lawsuits for his medical misadventures, depleting his millions and forcing him to declare bankruptcy. And in addition to his conviction of various medical frauds, he was also investigated for both tax fraud and mail fraud – a swindler in every sense of the word. The book is illuminating, fascinating, amusing and fast paced, and an all-around good read. on Amazon.com Kindle or in Paperback . 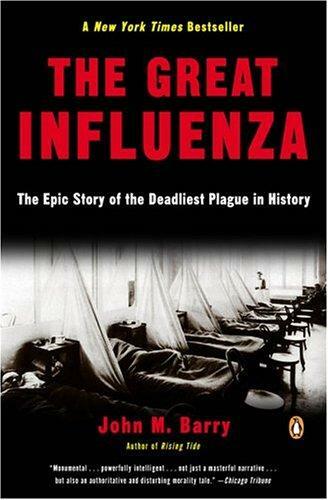 The Great Influenza by John M. Barry is a fascinating look at the influenza pandemic that rocked the world in 1918. This terrifying virus killed between 3-6% of the world’s population between June 1918 and December 1920, and infected almost 30%. It is a history book, but it is heavy in the science. It is a thoroughly detailed book, providing information and statistics from around the globe during the outbreak, although the book gives the most time to those in the United States. The perspective of The Great Influenza is primarily one of American citizens and cities and American scientists and doctors. It is set in the backdrop of the country’s transition to “modern medicine” from the period of home remedies and folk cures. A large portion of the early book is focused on laying a foundation for the tale of the pandemic by giving a detailed look at American medical history. I found this section of the book interesting and enjoyed the overlap it had with several books I’d recently read from the same time period, but I can see how one might find it extraneous to the story. Once you are past the more dry sections of the book, The Great Influenza reads very much like a suspense thriller – because it was. Pandemics are already scary by nature, and this book is no help to that fear. There are so many levels of concern: From the nature of the lethal virus itself, to the reactions of the politicians who were more worried about worrying people than saving them, to the total ineffectiveness of most measures taken to stop the spread. The result is fascinating, but chilling. The book also contained a lot of information that people might not have been aware of. Just as an example, I always remember being told that the reason the virus killed so many healthy young adults was because it was primarily confined to the military populations for the Great War. I’m sure others have heard similar things. While it is true that the War greatly aggravated the spread on many fronts, a major reason why so many young and healthy died is because the virus causes something called cytokine storm which is an overreaction of the immune system. For this reason, the people with the healthiest immune systems often ended up facing the most lethal symptoms, as their systems went into overdrive and killed them. The rest of the book is devoted to the scientists and doctors who dedicated their lives during the pandemic to its cause. Discovering the nature of the virus, its causes, how it was spread, why it was so deadly, and how to stop it was a unifying goal for many of these people. The Great Influenza tells their individual and collective stories, and discusses the work they did and any insight they were able to shine on the pandemic that was devastating the world. The book is not just about how the flu impacted the world, but how the world impacted the flu. Overall, the book is extremely well-researched and covers a huge scope of history, politics, and medical science for many decades. It is apparent that Barry put in a tireless effort to provide us with a thorough and informative book. It is absolutely worth reading not just for the story of the 1918 influenza, but also because of the illumination it provides on how the world should (and shouldn’t) handle future pandemics. On Amazon.com: Kindle or in Paperback . My intense fondness for the HBO Original Series The Wire inspired me to pick up the book Homicide: A Year on the Killing Streets by David Simon. Although Homicide more directly influenced the NBC show of the same name (which admittedly I’ve never seen), it is what started Simon down the path that eventually resulted in the creation of my favourite TV series. As the head writer for The Wire, it seemed reasonable I would enjoy his first book on the real life Baltimore homicide detectives. Unlike most other ‘true crime’ type books, Homicide does not follow one single case, one particular murder or killer. In fact, the book is not even really about the crime itself, although that provides a foundation for the contents. What Simon has given us is a special window to the detectives themselves, both as individuals and as a department. It’s about how they work, from the crime scene to the interrogation, their uniquely dark sense of humour, the politics of the homicide unit, socially and more literally. It’s a great angle, and one that makes the book feel unique in a genre where it could be lost in a sea of thousands of similar books. To write the book, Simon shadowed city homicide detectives for a year; the book is completely non-fiction unlike the shows that resulted from it. We get clear accounts from the police desks, to the streets, to the interrogation rooms, to the courtroom. The detectives are real, the cases are real, the dialogue is honest quotes. Some of the cases are solved during the book, but many of them remain open even today, a sad reflection of the realism of the book. Although old enough now to assume that much of the information within is antiquated, I still felt it was an insightful look into the job. I found myself recounting some of the stories to other people. One of the more interesting stories from the book is what Simon writes about after he finished his work with the Baltimore police when a new policy was instituted forcing department transfers every few years under the guise of preventing boredom. This change not only dismantled the homicide unit (and surely other good teams within the police force) but also destroyed one of the finest tools a homicide detective uses to solve cases: experience. Baltimore’s crime rate was already high and rising with drug-related violence, but had previously had a case clearance rate better than the national average. After this change, the amount of cases successfully solved decreased drastically. It was a very sad discovery to hear in light of Baltimore’s infamy for having a terrible homicide rate. Simon has a great writing style that really draws the reader in so they feel like they are standing alongside the men as they read. It’s dark and — to use a cliche — gritty, but very engaging and always interesting. The personalities and backgrounds of the detectives themselves are described in detail, but never boring or overdone. People normally adverse to non-fiction will probably enjoy that despite the fact the book does not have a singular “plot” to it, it reads very much like a novel. It has lots of dialogue, is full of amusing anecdotes, and the homicide cases Simon chooses to highlight are all very fascinating ones that could be told stand alone. Fans of The Wire will appreciate recognising stories and characters that were fictionalised in the show, but someone who has never watched it will not feel as if they have missed out. Homicide is a great read for anyone interested in reading about the police force, how murder cases are worked, for fans of either TV show, people who love reading True Crime, or people who just wanted to read about Baltimore’s struggle against violence. On Amazon.com: in Paperback or Kindle . I am always looking for good non-fiction books to read! Please leave me suggestions in the comments here.